The Washington Redskins were looking for their first playoff victory in a decade when Sean Taylor helped Joe Gibbs and company knock of the Tampa Bay Buccaneers. Unfortunately, their demise was foreshadowed by points left on the field in the first quarter as the Redskins were up only 11-0 instead of 16-0. From that point on, Aaron Rodgers returned to his reigning MVP form and shredded the Redskins defense with an assist from his run game. Green Bay finished the game outscoring the Redskins 35-7. Washington dropped their fourth straight playoff game, 35-18, and will head into the offseason. Though disappointing now, the franchise is in good hands with General Manager Scot McCloughan. After Aaron Rodgers picked up a first down on his first play from scrimmage, the Redskins forced a punt thanks to decent pressure on the reigning MVP in the pocket. On third down Dashon Goldson got a hand on Rodgers’ pass as he escaped from a collapsing pocket. Washington punted the ball right back after Jordan Reed had an unconventional drop on third down, but thanks to Tress Way had Green Bay backed up. The Redskins defense took advantage of Aaron Rodgers starting inside his own 10-yard line when Preston Smith continued his hot stretch. Smith, lined up against backup center J.C. Tretter at left tackle in place of David Bakhtiari, easily won off the line of scrimmage for the Redskins first postseason safety since 1984. Washington got its offense rolling with their tight ends. Newly signed Alex Smith, brought in Derek Carrier went down, caught his first pass as a Redskins and rumbled for a 16-yard gain, trucking over Packers in his path. Reed responded with an 11-yard first down, following Alfred Morris picking up one of his own. DeSean Jackson looked to have enough speed to turn a simple crossing pattern into a touchdown but after review was ruled a half-yard short. Alfred Morris was stuffed twice and Green Bay got away with pass interference on third down, so Washington settled for a Dustin Hopkins field to go up 5-0. 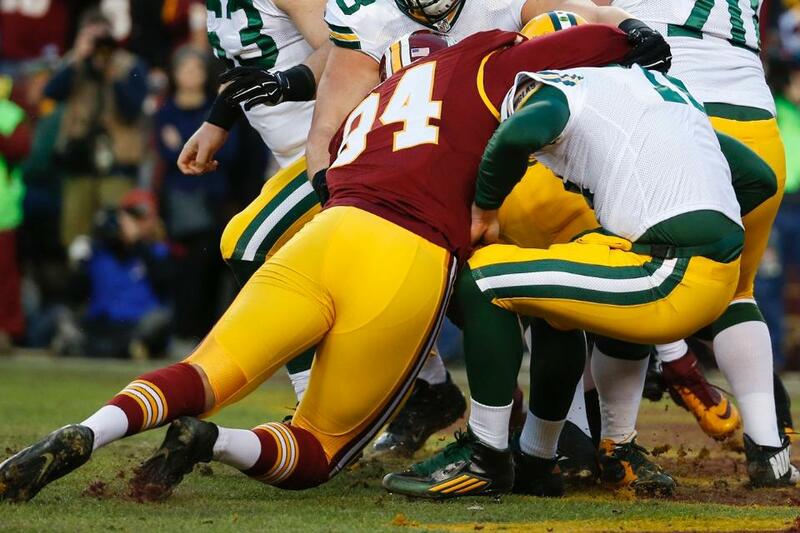 Green Bay sandwiched a Redskins three-and-out with two of their own. On the first, Rodgers overthrew an open Randall Cobb who had beat Will Blackmon, while the latter saw Quinton Dunbar break up a third down throw to James Jones. Washington’s drive was stalled when Kirk Cousins took a 12-yard sack from Clay Matthews when Sean McVay called for a deep shot to start the drive. The Redskins responded on their next drive by converting on third-and-three with Jordan Reed making a spectacular one handed grab for a twenty yard gain that probably also saved a pick-six. The Redskins went right back to Reed on their next third down play where he just ran past the Packers safety on a double move. Cousins threw the floater right on the money for a 24-yard touchdown. Hopkins missed his second PAT so the Redskins only led 11-0. 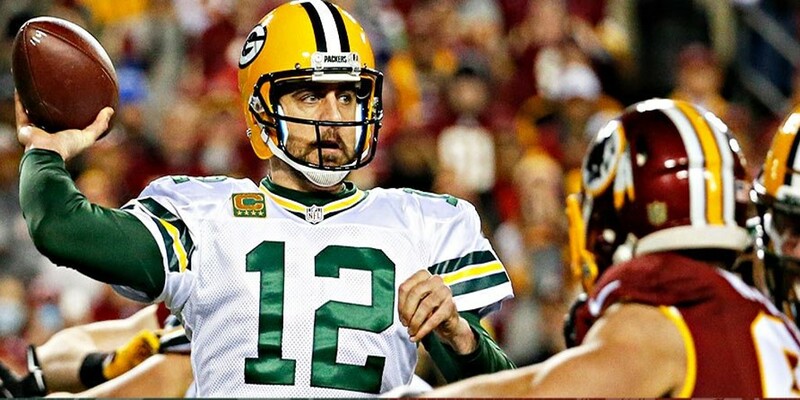 It was only a matter of time before Aaron Rodgers started to get going. After the Redskins gave away a third-down conversion for too many men on the field, Rodgers had plenty of time in the pocket to hit James Jones for 34-yards on an ad-lib play. After the Packers were able to move into the red zone, Rodgers’ continue to run the hurry up offense to perfection by again drawing another free play. The Cal product extended the play with his legs and was able to find Randall Cobb in the end zone for a touchdown against Will Blackmon. Just like that Green Bay only trailed 11-7. Washington looked to weather the storm by converting on third-and-6 and then a 25-yard burst up the middle from Chris Thompson. But then disaster struck as Morgan Moses, playing hurt, was beat around the corner by Mike Neal. Cousins did not feel the pressure and fumbled away the football to end a good looking drive. Green Bay quickly picked up two first downs before Rodgers missed Cobb down the field for a would-be touchdown. Quinton Dunbar came through again with a slight deflection on third down that resulted in the Packers settling for a field goal. Green Bay made Washington pay for conservative play calling nearing the end of the half by calling timeouts to get the ball back. Cousins made an incorrect read on third down which resulted in Jamison Crowder being blown up when the outside corner peeled off. Rodgers methodically moved the ball down the field with modest gains for first downs. On third-and-2 with 45 seconds to play in the half, Davante Adams made a great catch along the boundary for a 20 yard gain. Two plays later Rodgers hit Adams again in the end zone for a touchdown on a busted coverage from Dashon Goldson and Quinton Dunbar. Green Bay scored 17 unanswered points to go up at halftime 17-11. Similarly to the Eagles game when the Redskins were not feeling the best going into halftime, Kirk Cousins responded. Off a hard play action fake Pierre Garcon had a catch over the middle for 21 yards. Following a 19 yard burst up the middle from Alfred Morris, Washington was already on the edge of field goal range. Jay Gruden rolled the dice on a fourth-and-1 play where Kirk Cousins rolled out on a boot leg. Cousins stayed poised in the pocket when his first option was taken away and Clay Matthews fast in pursuit. 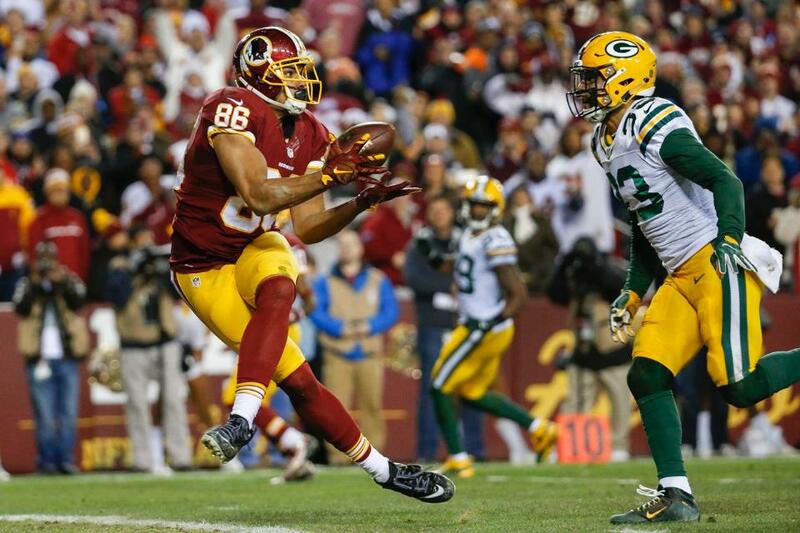 Jordan Reed made a fantastic catch in traffic and hung on to the football after taking a big hit from Casey Hayward. On third-and-goal from the three yard line McVay spread out the defense and allowed Cousins to walk into the end zone with a designed quarterback draw. After John Kuhn converted on two third downs and short for the Packers, Washington was able to stuff him the third time around thanks to Ricky Jean Francois. Mike McCarthy matched Gruden’s decision by going for it on fourth-and-1 just inside Redskins territory. Eddie Lacy bounced it outside for an 11 yard gain to convert on a huge momentum play. Lacy kept it going with a 30-yard run the very next play after having just six yards prior to this drive. James Starks then walked in for a four yard touchdown as the Redskins pitiful run defense was on display. The Redskins had no response as they went three-and-out following two overthrows from Cousins when he had both Jordan Reed and Ryan Grant open down the field. The latter may have been a miscommunication that caused Grant to trip on the play. Green Bay simply ran the ball down Washington’s throats. In one stretch they had run the ball on 18 of 21 offensive plays and it was working. After Quinton Dunbar was beat on third-down when he was caught out of position, James Starks ran for 45 yards over four straight plays. Eddie Lacy then finished the drive off with a two-yard dive and the Packers went up 32-18 following a two point conversion. Although the defense showed no sign of slowing down Aaron Rodgers, the Redskins had hoped Cousins could at least keep them in a shoot out. After Morris continued his solid performance with a 12 yard gain on third down and Jordan Reed with a 22-yard snap over the middle Washington was looking for a quick strike. That would not happen as Clay Matthews beat Trent Williams on an outside stunt to throw Cousins down for a nine yard loss. Following a couple of pitiful throws from Cousins, one of which should have been intercepted, Washington had to punt the ball back with under nine minutes to play. Washington finally forced a punt, even after a questionable pass interference call, but Cousins was not able to do anything with it as he continued to throw behind intended receivers. Trent Williams was beaten again on fourth down, which put the dagger in the Redskins season. Taking over deep in Washington territory, Green Bay tacked on a field goal to go up 35-18 with under five minutes to play. The home team could not even get any points against a prevent defense, as Cousins took his fifth sack of the game on a fourth-down play from the Packers 4-yard line. Even after the Redskins got the ball back following an Eddie Lacy fumble, Washington could not convert on fourth-and-17 following the Packers sixth sack. With the outcome clear for much of the second half, the Skins finally had their season come to an end with a 35-18 loss to the Packers. It will be a long offseason where the Washington Redskins will get ready to utilize their 21st pick in the 2016 NFL Draft. Then it will be OTAs, training camp, and the preseason before the start of the 2016 regular season. Neil Dalal is a Staff Writer for District Sports Page covering the Redskins, Wizards, and Maryland Terrapins. Neil grew up in Silver Spring, MD and attends the University of Maryland. Neil has loved everything related to the Redskins, Wizards, Capitals, and Terrapins since he was eight years old. However, he favors the Orioles, as he started watching baseball before the Expos moved to DC. You can follow Neil on Twitter @NeilDalal96.